Culms: Erect or ascending; simple initially, later usually branched above, often bent abruptly at bases, glabrous, rough or soft-hairy. Blades: Ascending or erect, lanceolate, 2-4 inches long, to 1/2 inch wide, firm, rounded at bases, rough and sparingly hairy or glabrous below, glabrous above; tips pointed. Sheaths: Longer than internodes, loose, distinctly ribbed, stiff-hairy or glabrous. Inflorescences: Panicles, pyramidal, 1.5 to 3.5 inches long; branches ascending or spreading, .75 to 1.5 inch long, wavy. Spikelets: Egg-shaped, less than 1/6 inch long, blunt, swollen, strongly nerved, sparsely pubescent or nearly glabrous, borne at ends of branches; awns absent. 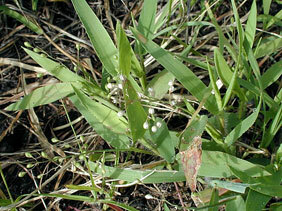 Habitat: Open prairies, meadows, disturbed ground, and occasionally in woods, more common on sandy soils. Forage Value: It can be grazed in fall, winter, and spring. It is palatable and nutritious to livestock but does not furnish large amounts of forage. Comments: Tufted. Scribner dichanthelium begins growth in the early fall and remains green throughout the winter. It was named for Frank L. Scribner, (1851-1938), a grass specialist in the U.S. Department of Agriculture.